If you spend any time investigating headphones you'll quickly find the two phrases "house sound" and "comfort" being bandied about frequently, especially on enthusiast sites such as Head-Fi. The term "house sound" refers to the characteristic sound and harmonic balance of a particular headphone manufacturer's products. Some companies, such as Grado, Stax, and Beyerdynamic, definitely have a particular sonic character that runs through most of their offerings. Other companies, such as V-Moda and Sony have many different varieties of sonic "flavors" from audiophile-pure to big bottom head-thumpers. And then there's "comfort." 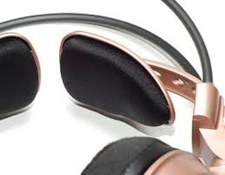 And how well a pair of headphones fit your head not only affects their wearability, but also their sound quality. With some headphones moving their position even slightly can change their sonic signature in profound ways. Two different listeners can come to widely different opinions about the sound of a pair of earphones merely because of the differences in fit between them. Of all the brands of earphones I've tried, for me Audio-Technica has the widest variety of fit - from perfect to awful. What's most surprising about this wide disparity of fit options is that they all use the same basic design - a pair of large curved metal rods with a spring-loaded pair of wings that rest lightly on your head. The first pair of Audio-Technica earphones that I reviewed were the ones that required the most "field modification" to make them fit my head properly - the limited edition ATH-W3000 ANV. When I first put them on the top edge of the headphone left a ½ inch gap between the headphone and my head. The only way to get a good seal required rather extensive reshaping of the metal headband from its stock C-shape to a shape halfway between a U and a V. The bending was not for the faint of heart or bicep. 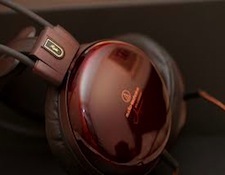 The second pair of Audio-Technica headphones I acquired was the ATH AD-900 open-air headphones. Once more I had to bend the metal rods. When I first put on the AD-900s they simply slid off my head because they did not sit firmly on my ears. Only by increasing the side-pressure by bending the metal rod's curve into a tighter diameter, could I achieve a decent fit. And when I did acquire the right fit, the overall sound quality of the AD-900s improved markedly, with tighter imaging, superior bass extension, and more open treble response. My third pair of Audio-Technica headphones were the ATH A-900x closed-cup earphones. Unlike the other two pairs, the A-900x's metal rods needed no adjustments for a proper fit, but after a couple of minutes of head-time I needed to raise the earphones slightly, as they had slipped down too low on my ears. The remedy was the "rubber-band mod" which involved putting a heavy-duty rubber band between the two wings on the headband, which increases the wing's down-pressure so they sit slightly higher on your ears.Now they fit perfectly. 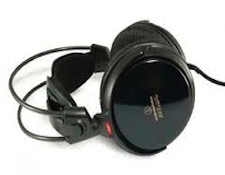 The last pair of Audio-Technica's in my headphone "library" are the ATH A-700 closed-ear cans. Buy Dig had a refurbished pair at a price I couldn't resist. But unlike their more expensive siblings, the ATH A-900Xs, the ATH A-700s are the only A-T headphones that fit me perfectly without a single adjustment of modification.How amazing is that? Now, if I didn't realize, know enough, or was "brave" enough to modify their headbands, I would have concluded that the A-700s were the "best" Audio-Technica headphones because they were the only ones that really fit me properly, without adjustments. 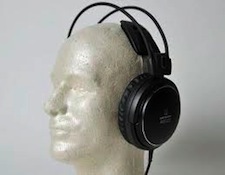 But after making the necessary adjustments, the other A-T headphones can out-perform the A-700s. But stock, right out of the box with no changes, the A-700s were the only Audio-Technica headphones I could actually use, because they correctly. So what can you, gentle reader, take away from this? Simply, that you need to do what it takes to make sure your headphones fit optimally before taking stock of their sonic performance. Also, don't be afraid to experiment and try as many fit options as possible with any set of headphones (or in-ear monitors) before settling on "the one" final set-up. I always push in and then pull out a pair of headphones once I've had them in position for a minute or so, just to see what additional or reduced pressure will do for their overall fit and the sound.